This is the lowest number I've ever seen on a trike. 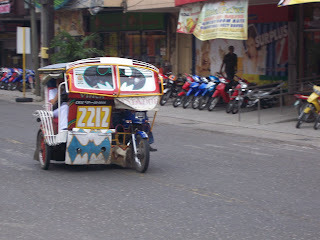 Just like every taxicab in America has a number, so does every trike. I know I've mentioned them before, but trikes are such a huge part of the city that they deserve to be described in greater detail! 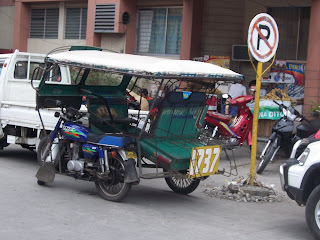 Trikes are made up of a motorcycle and a 2 backwheeled cart. The cart is bolted to the bike so it's one solid piece. The cart part of the trike has a roof, a bench that fits 2.5 Americans and then another bench that is directly across from the larger one that fits 1.5 Americans. But how many Filipinos can you fit in a trike? Well, there's always room for one more. The most I've ever riden with was 8 adults, plus the driver. It was amazing. We had 2 on the small bench, 3 on the big bench, 2 sitting behind the driver, and 1 tucked on the back of the cart. The drivers will decorate each trike differently, and that's probably what makes me like them the most. No matter how many trikes you see, none are ever the same. I made it my mission to find fun ones today, and I wasn't disappointed. Here's a fun batman one I saw on my way to school. Everyday you always see a different trike, and they never seem to get old. There's just so many little details about them; they're definitely one of my favorite parts of the city.